For a nation that goes to town about its heritage, India is quite poor at maintaining and—as S. Vijay Kumar’s The Idol Thief shows—holding on to said heritage. Underfunded and heavily bureaucratized government agencies, ineffective and lackadaisical temple committees, venal officials and the inexhaustible demand for rare antiquities among international museums have created the perfect environment for art thieves to thrive. Kumar’s book, which revolves around the takedown of a major gallerist and alleged art smuggler, Subhash Kapoor, lifts the veil on a sordid but fascinating world. Kapoor, a US resident and owner of the once-prestigious Art of the Past gallery on Madison Avenue in New York City, was nabbed in Germany in 2011 and extradited to India in 2012. While he remains under trial and the full extent of his decades-long perfidy is still coming to light, Kumar offers a racy ringside view of the case, exposing bigger systemic problems that extend from India’s heritage sites to famous international museums. Kumar, who is from Chennai, works as a general manager with an international shipping line in Singapore. He has been an amateur antiquities buff and an idol hunter for over a decade. In 2014, he founded the India Pride Project (IPP) to formalize his hobby of tracking and locating stolen Indian antiquities. Kumar is part of his own story, as he played a crucial role in helping build the case against Kapoor. Over the past few years, he has also been instrumental in getting several high-profile antiquities back to India, including a 12th century Pala Buddha bronze last month that was part of a hoard stolen from Nalanda in 1962, which Mint reported. The book is structured like a whodunnit of the Hitchcockian variety, where you know what the crime is and also who the criminal is—the suspense lies in connecting the two, with many twists along the way. The book begins with a depiction of Kapoor’s high-flying life as a gallery owner in New York and charts the way he curried favour with some of the world’s top museums to become a leading supplier of Indian antiquities. Parallelly, it reconstructs a hypothetical history of the creation of two Chola era bronzes, from around the 11th century, foregrounding the devotion and sacrifice of the image’s guardians. The scene then shifts to their theft, along with many other contemporaneous idols, between 2006 and 2007, from two old temples in Sripuranthan and Suthamalli in Tamil Nadu. This loot was sent to New York, via freight routes from Mumbai and Chennai, often with long layovers in places like Hong Kong and London, where they were restored and touched up by a reputed art restorer, Neil Perry-Smith. Kapoor would hold on to the statues for a while to let the trail grow cold, then procure fake provenance letters and sell them to museums. The Sripuranthan Nataraja, for example, was sold by Kapoor to the National Gallery of Australia in Canberra, within a few years, for $5.1 million (around ₹ 36 crore now). Indeed, when Kapoor’s warehouse in New York was raided by the US authorities in 2012, art worth $100 million was recovered. Of course, in all this, Kapoor couldn’t have acted alone. We are introduced to a wide cast of characters who helped and enabled him in various ways. These include an unnamed, “famous" art historian, who has institutions like the Metropolitan Museum of Art and Hollywood celebrities eating out of his hands, and was instrumental in Kapoor’s big break in the late 1990s. There are rogue art dealers and smugglers in India—Sanjeevi Asokan and Deendayal, both from Chennai—who ran extensive idol-lifting networks in south India. Then there are the international museums and their curators, who seem only too ready to believe any paperwork Kapoor would provide as provenance; and a whole nexus of international art publications and historians who would work to grant a piece of stolen antiquity legitimacy in return for access and influence. Finally, the book throws light on Indian agencies and the larger state of heritage conservation—compromised, starved of resources and clout. Written in a breezy, conversational, and often gossipy style, the book is a page-turner. Although Kumar continues to play a crucial role in tracking stolen art, he seems self-effacing about it. His overwhelming emotion is of anger and bafflement at the thefts, as well as at the collusion and cluelessness of Indian law enforcement agencies. Often, his contempt for the international art world comes across as too strong, but knowing what he does, that’s hardly surprising. Ultimately, The Idol Thief shows that despite all the talk about arrests and restituted statues, the success of a big bust is largely tied to chance. India still doesn’t have a law enforcement team dedicated to antiquities. And therein lies its tragedy. 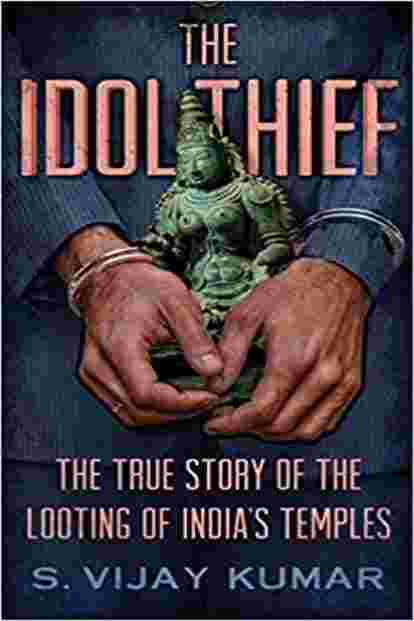 The Idol Thief: By S. Vijay Kumar, Juggernaut Books, 225 pages, ₹499.